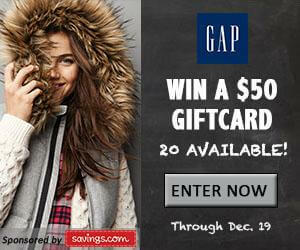 Win a Gap Gift Card! Savings.com is giving away $1000 worth of Gap Gift Cards. 20 winners will receive a $50 Gap Gift Card. Enter here! Giveaway ends Friday, December 19, 2015, at 11:59 p.m.
ALSO, while we are talking about the Gap… Buy ANY 3 Items at The Gap and get 40% off! Save 40% on all orders when you buy any 3 items from The Gap. Offer expires 12/17/2015. No Promo Code required. 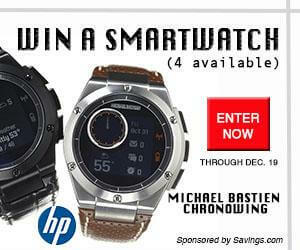 Win a Michael Bastian Chronowing Smartwatch engineered by HP. 4 lucky winners will each win an HP Smartwatch! Contest ends Friday, December 19, 2015, at 11:59 pm ET. Love HP stuff as much as I do? Save $15 on orders of $75 or more plus get FREE shipping. Use PROMO CODE: 15LESS75. Limited time offer. Offer expires 2/1/2015. Click here for offer.